SNIFFY is described as the first screen able to trigger our five senses; the faculties of sight, smell, hearing, taste, and touch. 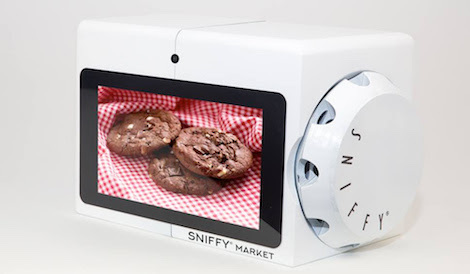 That’s right, SNIFFY brings to the screen, the smells of good sweet recipes, perfumes or fruits – all aimed at enhancing the customer experience. It works through a rotative multi-diffusing connected system (RFID) and it’s able to release a calibrated perfume from a specific programmed cartridge. SNIFFY will be at #CES2018 in Booth 51271. This entry was posted on Tuesday, January 2nd, 2018 at 08:41 @404 and is filed under DailyDOOH Update. You can follow any responses to this entry through the RSS 2.0 feed. You can leave a response, or trackback from your own site.